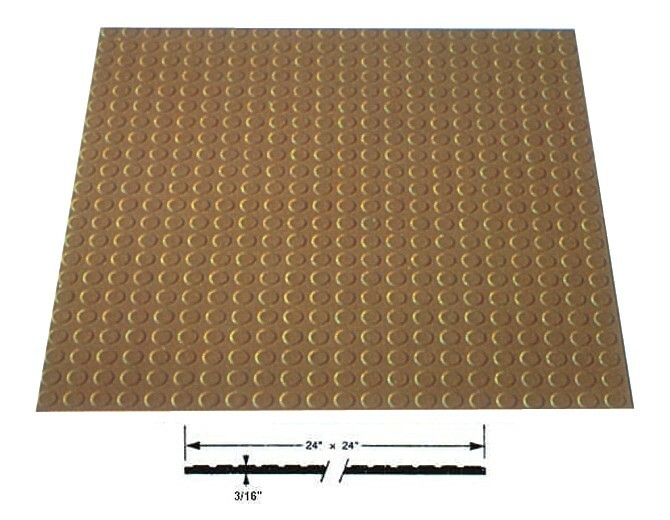 Disc-O-Tile Rubber Tile - Commercial Floor Matting | Mats Inc.
3/16" x 24" x 24"
Unique floor tile with raised circular disc, 3/4" diameter, for better traction. Circular pattern matches DISCO-O-TREAD stair treads. Factory cut 24" x 24" square tiles for fewer joints and quicker installation. For use in commercial, industrial or institutional buildings. Contains no asbestos fiber and the color extends throughout the thickness of the tread. Flame spread rating of 25 or less using ASTM-E-84 test. Select standard color from Series III. Series III: Beige, Black, Burgundy, Dark Blue, Dark Brown, Dark Green, Light Gray, Medium Brown, Medium Gray, Slate.